Infrared Saunas leverage infrared radiant heat for optimal absorption by the body unlike traditional saunas which heat the body indirectly by air or steam. An infrared session is a great way to both start and end a workout—increasing flexibility and mobility to prevent unnecessary injury. Infrared Saunas are quickly growing in popularity due to their lower temperatures and increased benefits of detoxification over traditional saunas. Heating takes no time at all. When you are ready to relax, so is your infrared sauna. Our saunas let you set the mood for each session with a variety of light and sound settings for your preferred comfort all managed from an easy-to-use touch screen control. 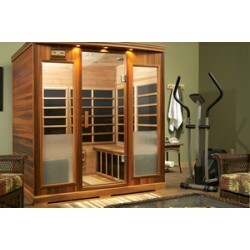 We offer only safe low EMF infrared saunas. Our sauna services include service, supplies, components/replacement parts, sanitation, contract maintenance, sauna restoration, testing, safety inspection, ADA compliance and full service sauna installation. Infrared Panel Built Prefabricated Sauna Room is 39 1/4” x 36” x 76 3/8”, Seats 1 Person, Hemlock..
Helo Onyx Panel Built Prefabricated Infrared Sauna Room, 72" x 84" x 84", 6KW Heater, IS400 Syste..
Infrared Panel Built Prefabricated Sauna Room is 43 5/8” x 47 5/8” x 76 3/8”, Seats 2 Persons, He..
Helo Onyx IS Panel Built Prefabricated Combination Sauna Room, 72" x 84" x 84", 6KW Viki 60-D Hea..
Infrared Panel Built Prefabricated Sauna Room is 44” x 64” x 76 3/8”, Seats 3 Persons, Hemlock, I..
Helo Northern Star Panel Built Prefabricated Infrared Sauna Room, 61" x 61" x 84", 5 Sided, 4.5KW..
Infrared Sauna Room is 47 5/8” x 71 1/4” x 76 3/8”, Seats 3 Persons, Hemlock, Includes Low EMR/Lo..
Infrared Panel Built Prefabricated Sauna Room is 60” x 71 1/4” x 76 3/8”, Seats 4 Persons, Hemloc..
Helo Serenity Panel Built Prefabricated IS Combination Sauna Room, 74" x 84" x 84", Curved Glass,..
Infrared Panel Buitl Prefabricated Sauna (Corner Style) Room is 56 3/8” x 57 3/4” x 76 3/8”, Seat..
Helo Serenity Panel Built Prefabricated Infrared Sauna Room, 74" x 84" x 84", Curved Glass, 6 KW ..
Infrared Panel Built Prefabricated Sauna (Corner Style) Room is 59 7/16” x 64 7/8” x 76 3/8”, Sea..
Infrared Panel Built Prefabricated Sauna Room is 39 1/4"" x 36" x 76 3/8", Seats 1 person, Hemloc..
Infrared Panel Built Prefabricated Sauna Room is 39 1/4" x 36" x 76 3/8', Seats 1 person, Cedar, ..